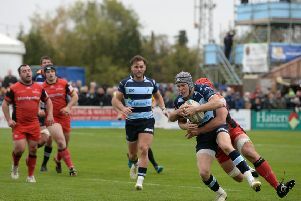 Bedford Blues were given one of their toughest pre-season training sessions as they were put through their paces at a Mixed Martial Arts workout. The players headed to the Rising Crane Centre in Melbourne Street where they met up with David Rogers, who is the chief instructor of Rising Crane – Bedford’s longest running, fully equipped, full-time martial arts academy. The players may have thought that they were in for an easy time, but it soon became apparent that this wasn’t the case. The session started with a technique-based warm-up, and then the players were unleashed on punch bags and pads. Rogers used a combination of MMA drills such as kicking, punching and wrestling to push the players throughout the whole session. Blues strength and conditioning coach Andrew Petts said: “The players absolutely loved the session and it was clear to me and the other coaches that it was a great success. “We’ve worked hard to produce a pre-season schedule that will really challenge the players and put them a little outside of their comfort zone – pushing their fitness on to another level. “The session at Crane Rising was perfectly planned and delivered by David and his assistant Rory and I was delighted with the attitude of the players throughout. Rogers added: “Our MMA program is taught as an integration of striking and grappling, both on the feet and on the ground. The aim is to closely simulate the conditions of a real fight as intensely as possible whilst still being safe for the students.